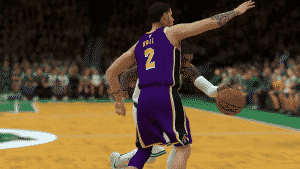 It wouldn’t take long to notice that AI defense in NBA 2K19 is better on ball. The AI arguably borders on OP to many as they simply will not let you expose the ball in front of them without attempting and often getting a steal. As a result, the defense dashes the hopes of many ballers who hoped to break the AI’s ankles with little to no regard for ball protection. To make matters worse the amount of time you can expose the ball in front of them gets shorter and shorter the better the player is guarding you. The same goes for the higher the difficulty you play on. This makes guys like Kawhi Leonard and Draymond Green seem like stone walls to the average gamer. However, there is are ways to break the defense, although, it may eliminate your randomly strung together dribble moves. Luckily, a lot of the moves I went over in our dribbling tutorial will work against the computer despite being geared towards human opponents. The difference is, you must be way more careful with the ball than you do against the average human opponent. Due to the computer’s aggressiveness, the trick is how you handle them when their in your face. The main goals should be ball protection and creating enough space to pull off your dribble moves. Since the blow by animations aren’t as easily triggered this year, we’re really going to have to get the defender to move their feet to get by them. Utilize the Step back Dribble (hold RT/R2 and Right Stick down) and your ball handler will take a hop backwards. Now if you have already started dribbling and the defender starts to press, you want to utilize the protect the ball button (LT/L2 on your controller). This has you use your body to block the defender from reaching in and stealing the ball. This is key when your dribbling and want to run a play or a pick and roll. Of course, you can also use it in tandem with backing up to create space with the aforementioned two methods. In my Pick and Roll video, I mentioned you can start to creep towards the screen, to counter the defenders’ need to block your path around it. However, I didn’t mention if you’ve dribbled the ball, you need to be in the ‘protect the ball’ stance as you creep closer. Calling a screen while you’re at half court takes advantage of the computers over aggressiveness towards you. Let them take themselves out the play by trying to jump your path and you then have the entire court as your playground. While dribbling, make sure the ball is in the opposite hand of where the screen is coming from(screen on the left-ball in the right hand , screen on the right-ball in the left hand). Since you’re in the ‘protect the ball’ stance a lot of the time since, it will trigger a keep away animation between you and the defender that prevents the defender from reacting to the screen. Once you notice the computer isn’t moving you want to pull off a cross escape hesitation dribble(tap the right stick twice to the screen side hand) and you will launch around the screen with plenty of room to work.